This is the ruins of a tower used for observation and defense by the Ming Dynasty&apos;s troops in the area. When you climb it, you can look around at the desert scenery. If you are taking a tour to Taiyuan or one of the other nearby places, it would perhaps be worth a visit. 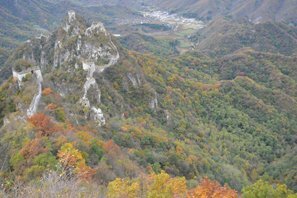 While there, you might want to see nearby Hongshi Gorge too. See below. History: It was built in 1607 near the end of the Ming Dynasty. It was built to oversee and protect the important center for trade with the Mongolians. This fortress is located on Mount Hong (红山 Hóng Shān &apos;Red Mountain&apos;). 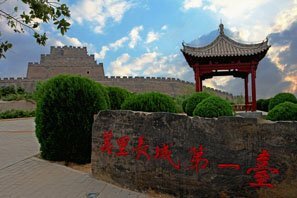 It is five kilometers north of Yulin City, and it was originally built by Ming Dynasty (1368–1644) officials to protect this area along the Ming Great Wall from attacks or thievery by the local population. The fortress stands at the site of an important trading market where the locals traded with Mongolians who lived to the north of the wall. It was built in 1607 out of bricks. It is a four story structure now, but there was once a lookout tower on the fourth floor that is now gone. From the high tower on top of the mountain, watchmen could survey a wide desolate region for movement. The market was important for the Ming Empire because they imported horses from the Mongolians. 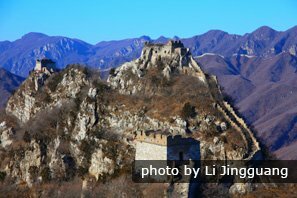 This fortress was important to the dynasty because it helped control an area for potential attack or trouble with Mongolians who wished to conquer the empire. The Mongolians did so about 37 years later. See the Great Wall at Yulin for getting to Yulin. Take a taxi to Zhenbeitai from Yulin city center, or you can get bus 3 from Yulin’s Guangji Mansion. The tower is about 3 kilometers north of Yulin&apos;s center. Bus: Take a tourist bus or bus 3 or 11 in Yulin and get off at Zhenbeitai. Taxi: The cost is 15 RMB for a 15-minute ride. China Highlights offers private chauffeured transport and an English-speaking guide as a more comfortable and convenient alternative to public transportation. Our private tours come with a private vehicle and driver suited to your group size. An English-speaking tour guide helps for all your communication needs. 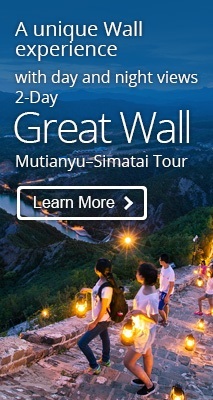 If you are interested in traveling to Yulin and Zhenbeitai, we can modify one of our Great Wall tours for you. If you would rather design your own Zhenbeitai tour with our help, tell us your interests and requirements, and China Highlights will tailor-make your Great Wall tour. 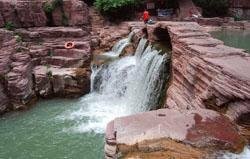 Hongshi Gorge: Just 2 km (1.2 miles) away, a waterfall pours into a lake at scenic Red Stone Gorge. Inscriptions on the walls are interesting. 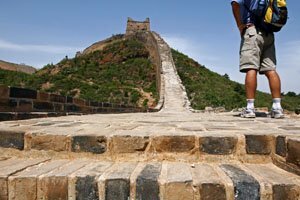 There is an old section of the Qin Dynasty Great Wall nearby that is another of Yulin&apos;s top attractions. That empire built a 267 kilometer wall in this area, and this is some of the remains of that wall.